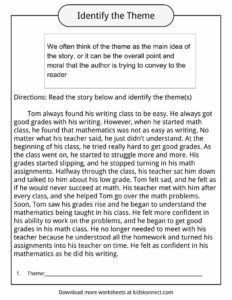 We often think of the theme as the main idea of the story, or it can be the overall point and moral that the author is trying to convey to the reader. A theme can often be described as the “life lesson” that a story depicts or shows us. We look at the main idea of the story and apply it to our own lives. Themes help us understand a concept or an event that happens in our lives and in the real world. A theme teaches readers about something in life, or it teaches the reader something about living. A good way to identify the theme is to ask, “What is the story trying to tell me about life?” Many times we think of proverbs or short sayings that give pieces of advice and statements of truth. For instance, a common proverb is “money cannot buy happiness.” As a theme, this means that you cannot make yourself happy with objects and things. Instead, you need to find happiness within yourself, not with things. A piece of writing with this theme might tell the story of a man who keeps all his money, ignores his family, and lives in a house with lots of material things. For instance, the well-known story A Christmas Carol deals with this theme. In the story, Scrooge saves his money and is not kind to others because he only cares about money. By the end of the story, Scrooge realizes that money will not make him happy; instead, people, friends, and family will truly make him happy for the rest of his life. John was new at his elementary school. On the first day at his new school, we quietly walked into class and sat at a desk in the back corner. None of the other students talked to him. At recess, he found a book at the library and read it under a tree near the playground. For the next few days, none of the students talked to him, and this made John sad. John would watch the children play basketball and jump rope. He wished he could play with them. Finally, one day, he decided to go up to one of his classmates and ask to play basketball. He was nervous and shaking, but he politely asked his classmate to play. His classmate agreed and they had a wonderful time playing basketball. The next day, his classmate asked him before recess to play, and John gladly agreed. John and his classmate then played basketball almost every day. John didn’t read by himself under the tree anymore. Sometimes, John’s classmate would sit and read with him. What is the theme of this story about John? The theme is not directly stated, so we must figure out the theme ourselves. There are several possibilities in this story. From the conclusion of the story, we can draw the conclusion that having courage can help us gain happiness and find friends or connections with others. We may also say that the theme here is that we all need a friend, because not having a friend made John sad. 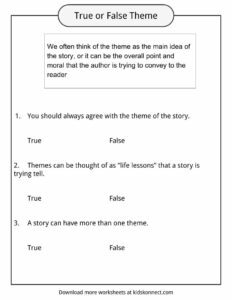 Stories can have several themes, and you do not have to agree with them. While the theme may not apply to your life, they may apply to the lives of others. 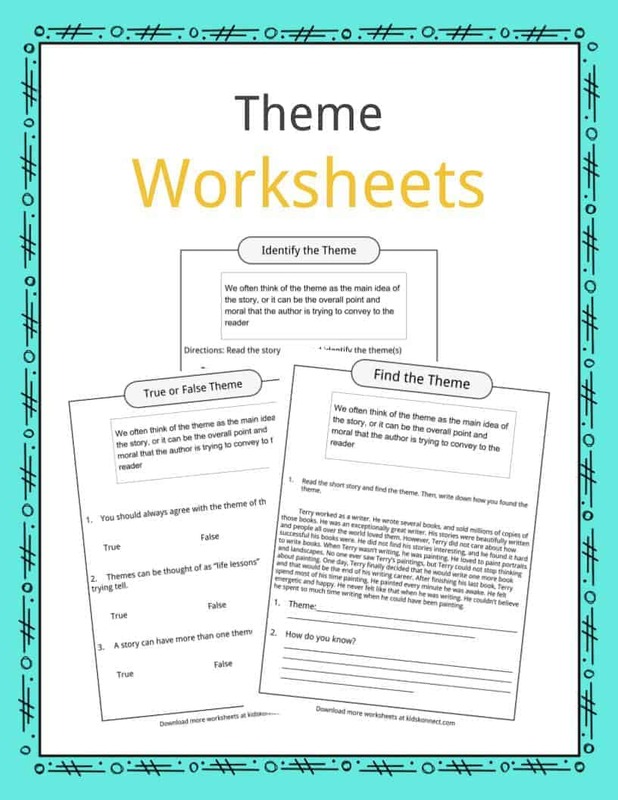 This bundle contains 5 ready-to-use Theme worksheets that are perfect to test student knowledge and understanding of what Theme is in relation to a story. 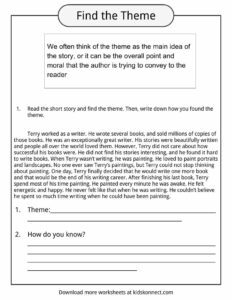 You can use these Theme worksheets in the classroom with students, or with home schooled children as well.